Stratford is a town of 28,000 people vastly increased in population in the summer by the tremendous influx of tourists. Visitors come from all over the continent and from abroad to see the Festival Theatre, the Avon Theatre and the Tom Patterson Theatre. 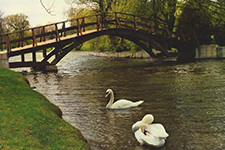 Stratford has a beautiful park with its resident swans on the Avon River. A quality Art in the Park takes place every Wed. Sat. and Sun. Backstage tours of the theatre give one rare insight into how exactly the great theatre really works. St. Marys is a town of 5000 people. Built on solid limestone it is known as the Stonetown. It boasts some of the finest homes and churches that the famed Scottish stonemasons could build. 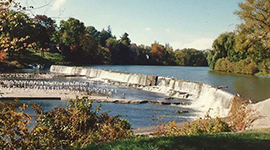 A lone Scottish piper still plays beside the town's wide falls for an hour on Friday in the cool of a summer's evening. 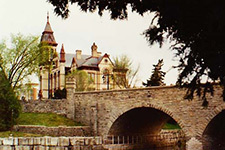 The homes and buildings are far more elaborate than one would assume for a town its size, well worth a leisurely tour. St. Marys has some good quality restaurants, shops and a museum. 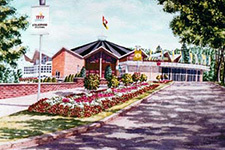 It also boasts the home of the "Canadian Baseball Hall of Fame". London Ontario is a town of 350,000 people. Dubbed the "Forest City" for its abundance of trees it has excellent shopping facilities. stage, movie and Imax theatres, a racecourse, and many other forms of entertainment. 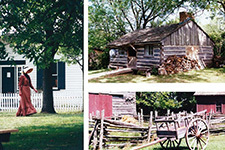 The "Fanshawe Pioneer Village" gives a glimpse into London's past with its costumed interpreters. 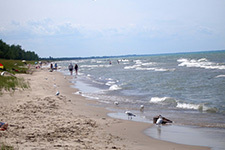 BEACHES: Lake Huron is only 40 minutes away and is known for its lovely sandy beaches. Lake Huron of course is more like a huge inland freshwater sea. "20 minutes to Stratford, 20 minutes to London, 10 minutes to St. Marys (good shops and good restaurants). 5 minutes to golf, 25 minutes to horseback riding and 45 minutes to sandy beaches of Lake Huron"
View The Stratford Festival Playbill. View Calendar Dates & Times. Just down the road from ordinary, around the bend from usual and only 20 minutes from both Stratford and London is Valley View B&B... Welcome. world class theatre (the plays at Stratford go into November. They do have some discounts on tickets in October (late fall). On the way to St. Marys you can often see the Great Blue Herons fishing in the Thames river.